I was delighted to spend this past weekend performing and volunteering at the wonderful international festival for poetry in St. Andrews, StAnza. It was my second time attending the festival, and I had an incredible weekend of hearing/watching/reading/making/performing poetry, chatting with other poets and organisers, and a huge amount of stimulus and inspiration. My head is buzzing with ideas that need out! 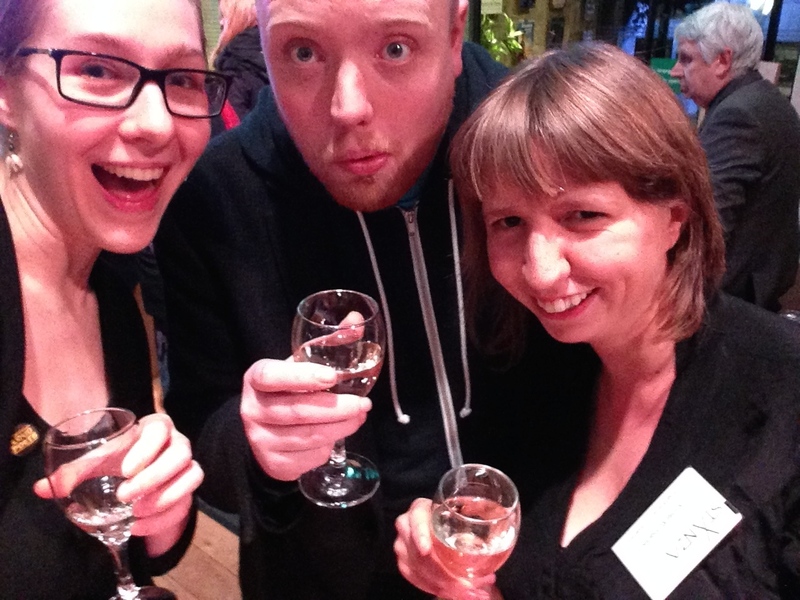 So here I’ll share some of my reflections from the festival. There are lots of other folks blogging about their experiences as well – check out Carly Brown’s posts as the StAnza in-house blogger here and Dave Coates’ reviews on his (awesome) website, here. 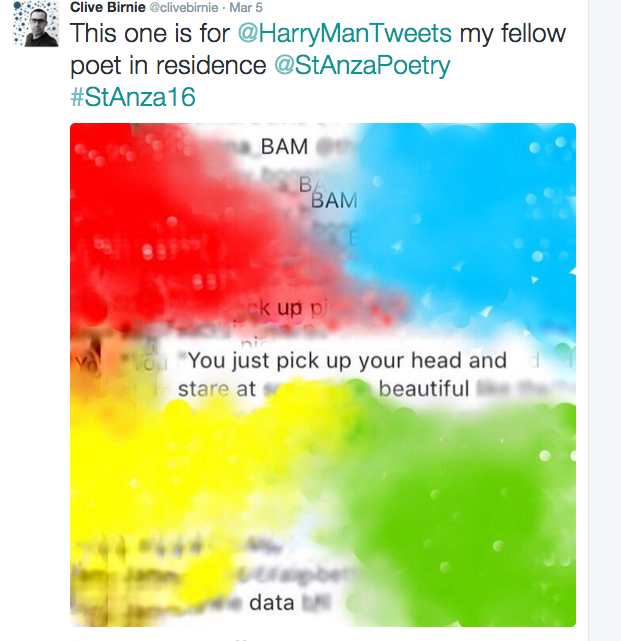 You can also search the #StAnza16 Twitter hashtag or check out the @StAnzaPoetry Twitter feed to see the live-tweeting from the weekend. 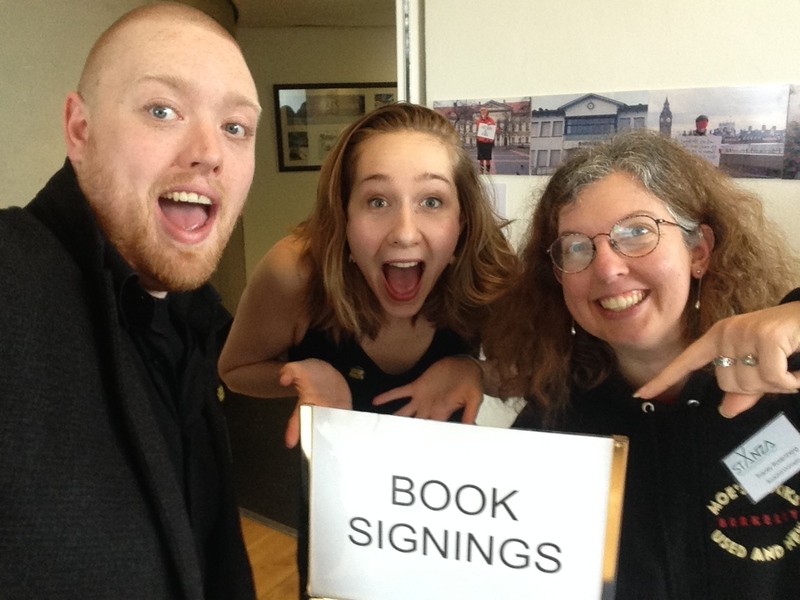 Kevin Mclean and me after our Poetry Cafe show with our friend Tracey Rosenberg, who’s in charge of the bookstalls at the festival. 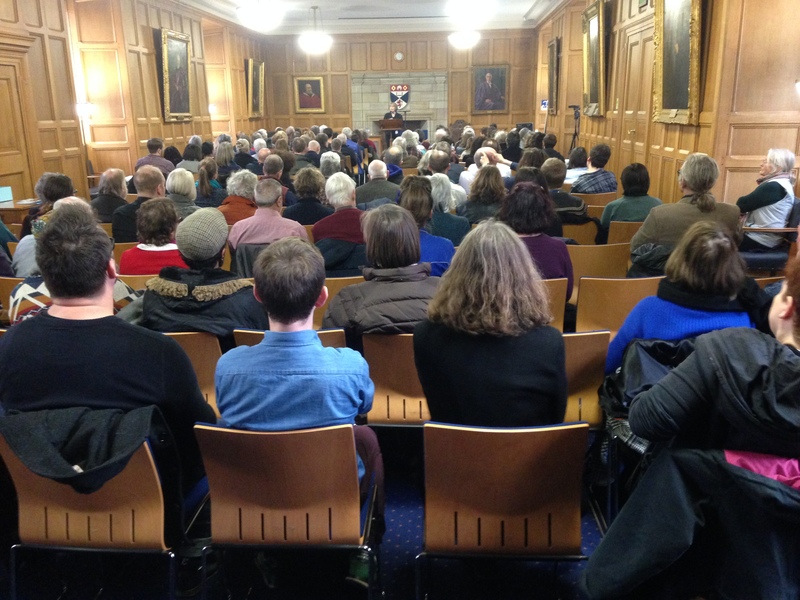 The packed house at Five O’Clock Verse on Friday. StAnza this year was buzzing with fresh work and ideas that I’d imagine will be flitting around my head for months, but here I’ll just share my major impressions. Perhaps my biggest takeaway from the festival was the (re)realisation that there are a vast variety of ways in which poetry can be composed and transmitted. 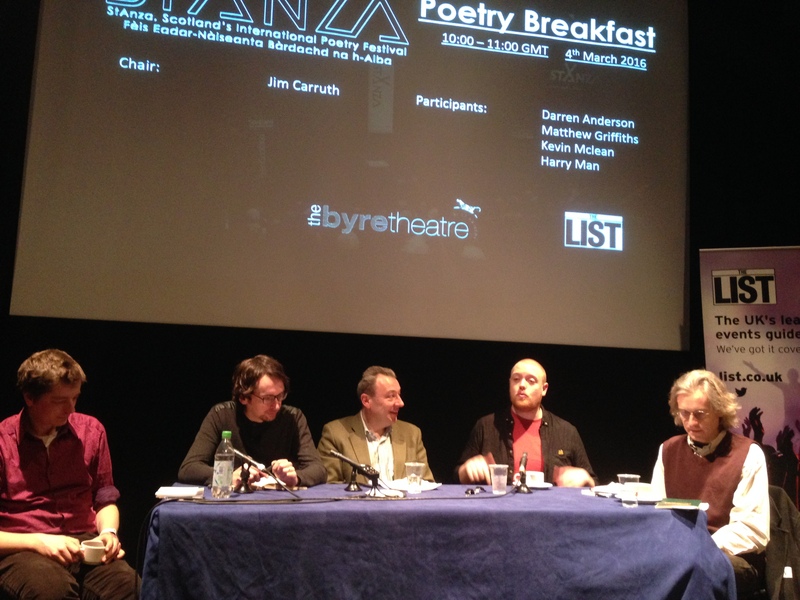 StAnza’s programme progressively reflected the ways in which our definitions of poetry continue to expand with new innovations and new technologies through which to create and disseminate work. There were ‘traditional’ readings at the festival, of course (poet behind podium reading from text), but that model was also experimented with in many ways: through more interactive performances (like Jo Bell’s Five O’Clock Verse performance, in which she got the audience to sing along), through engaging, seemingly spontaneous performances (I’ll go further into Lemn Sissay’s Centre Stage performance below), through performance poetry shows dipping into theatre (such as Jemima Foxtrot’s enchanting “Melody”), through the experiments in collective readings on Saturday. In addition to these innovations in live performance, StAnza showcased several different ways of creating and publishing poetry digitally, perhaps most notably Clive Birnie’s fantastic Instagram cut-up poems (check out his IG feed for more of these). One of Clive Birnie’s cut-up poems made during StAnza, shared on his Twitter feed. Lemn was remarkably gracious in his response, calming the audience’s frustrations at the interruption by reminding us that people should be able to say what they wish; that free speech is a central point of the festival, in a sense. Later, though, Lemn seemed to address the heckler and the poetry world more generally when he claimed that in his sets, he does whatever he likes; that his performances arise from his mood in that moment and that when organisers book him for shows, they have no guarantee of getting one thing or another. This comment reflected the high value performance poetry communities place on authentic, genuine expression, but also served as reminder to the audience that the definition of the poetry reading is evolving with new movements and new expectations. We’ve come a long way from the intimate salons in which actors would present a poet’s work to a small group of people; now poetry is being presented on TV, on huge stages, and must compete with other genres in an arena with very different pressures. 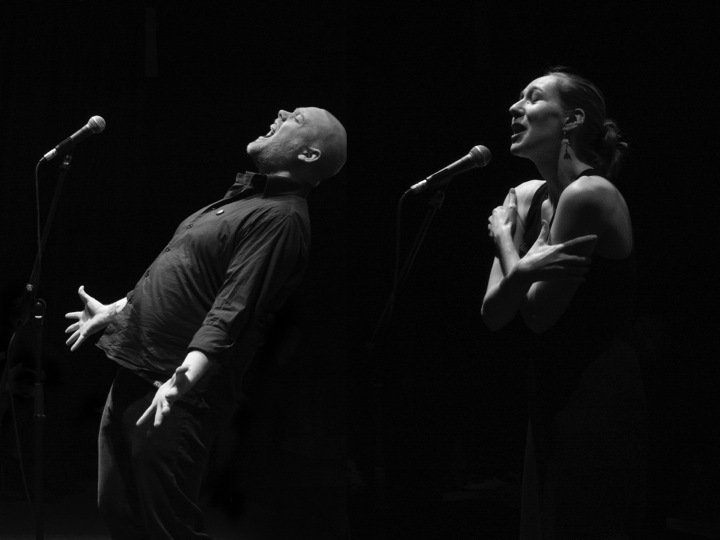 There is an expectation now for performance poets (indeed, probably for most poets in large venues) to entertain and engage the audience, to connect with them, to craft sets with narrative or thematic flows and amusing between-poem banter. Lemn was masterful at this; however, from the heckler’s perspective he was just fooling around and not doing what he’d been booked to do. Lemn Sissay onstage at the Friday night Centre Stage. It seems to me that the heckler’s frustration—and the frustration of many other critics who consider enthusiastic banter during poetry sets to be inappropriate gimmickry, lacking gravitas—stems from their application of the wrong set of expectations or standards to a poet’s work. When one approaches a poet with the expectation that he/she will do a certain thing—that they will softly read from a book behind a podium, with silence between poems, crafting a meditative state, or that they will leap about the stage dramatically, theatrically thrilling the audience—when the audience applies their expectations for a certain ‘type’ of poetry to all poets, that’s when we criticise on the wrong criteria, when we condemn a poet for doing exactly what they were aiming to do. Soon I’ll be publishing a post on the need for critics and poetry fans to consider the varying sets of expectations and standards for different ‘genres’ of poetry when approaching poets who work in different styles. It can be tricky to write about this without reenforcing the page/stage binary, but my aim is to encourage audience members not to judge poets according to pre-set notions of what poetry has traditionally been or should be, but instead to come to each show fresh, prepared if necessary to expand their definitions of what poetry can mean. I think most festival-goers this year did do that: it was wonderful to see folks laughing and clapping enthusiastically at the performance-based Poetry Cafe events, many of whom said they were new to this type of work. The wonderful Kirsten Luckins performing at the Poetry Cafe on Friday. 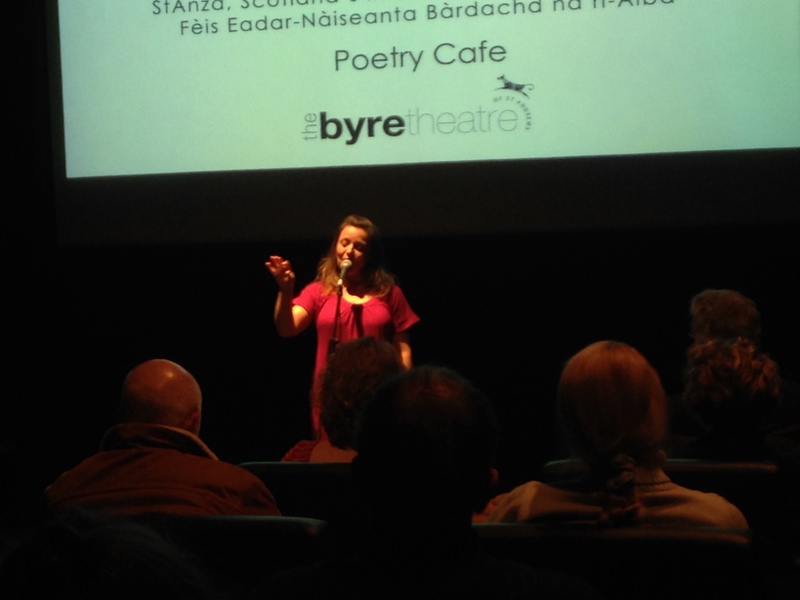 One of the themes at StAnza this year was ‘Body of Poetry,’ and the programme offered a wide range of ways to experience poetry through all of the senses, in addition to performances and discussions about the way bodies are considered in poetry more generally. This included a Perfumer-in-Residence pairing poems with scents for a heady sensory experience; unfortunately I just missed the end of that exhibition, but I’m told it was wonderful (Carly wrote more about StAnza’s engagement with the senses here). The ‘Body of Poetry’ panel on Saturday morning sparked some fascinating questions about consent and permission when writing about one’s own body and others’ bodies. It featured Justin Stephenson, SJ Fowler, Aase Berg, Clare Best, and Andrew McMillan. McMillan, whose recent collection Physical garnered many awards, writes about contemporary masculinity through honest, intimate explorations of male bodies. Near the end of the panel he rhetorically queried: “If I wrote about female bodies in the same way in which I write about male bodies, would that be acceptable in today’s society?” He implied that in ninety years, perhaps his work would be perceived as objectifying or similarly outdated, calling attention to the different societal policing of bodies according to gender. In his reading during Five O’Clock Verse later that day, McMillan read a piece about his electrician’s daughter dying and prefaced it with a similar question: is it OK for me to talk about a body, a story, which isn’t mine? His solution was to introduce the performance of the piece with these qualifiers, and within the poem to simply “tell the facts of the situation,” as he put it. These questions of ownership over narratives can be so difficult to navigate, particularly considering increasing awareness about appropriation of cultural heritage and personal narratives (this conversation has been especially visible in the music industry). It can be a tricky line to walk as a poet drawing inspiration from his/her perceptions of others’ lives: when is a piece inappropriately and voyeuristically telling a story which is not the poet’s to tell, and when is it presenting a refracted view of a situation through the lens of the artist such that it can be deemed art, rather than theft? These questions—which deserve a far wider conversation than I can provide here—are particularly salient when the writing concerns bodies. 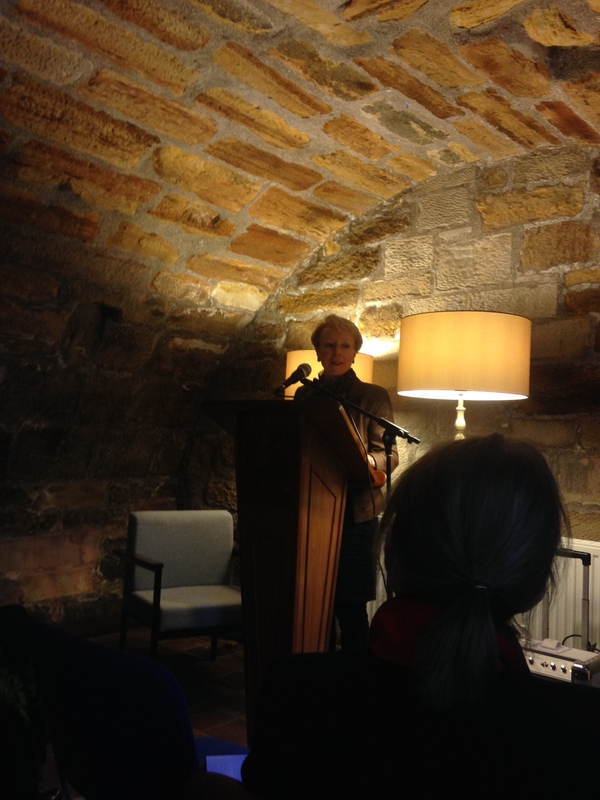 Clare Best reading at the Undercroft during Border Crossings on Sunday. Other poets explored this theme of bodies and invited intimacy in fascinating ways. It was my first time encountering the work of Clare Best, but I left the festival considering her readings one of its highlights. One of the subjects which Best has focused on in her recent writing is her experience of undergoing an elective double mastectomy to prevent developing the breast cancer which has afflicted her family. Best’s work honestly and unflinchingly narrates this experience and its effect on her life, often with an unexpected streak of humour. You can find some of the poems from her project ‘Self Portrait Without Breasts’ on its blog, here, and within the pamphlet of that name and her book Excisions. Best read at Border Crossings on Sunday with the wonderful Meg Bateman, whose work lyrically illustrating the Scottish landscape through Gaelic and English paired well with Best’s exploration of the shifting landscape of the body. Best’s and McMillan’s readings in particular, with their frank explorations of their own bodies, caused me to reflect on how the performance of such poems becomes in some ways the performance of one’s self. This idea is currently the central concern of my doctoral research, so I’m sure it’ll pop up in future posts and thus won’t go into it too deeply here. Essentially, I’ve been thinking about the importance of the genuine in contemporary poetry: the way in which we value the articulation of what we perceive to be authentic. We are drawn to poetry, it seems, by a desire to hear our truths told: to get straight talk (there’s a wider conversation here about the essentially artificial nature of all art which deserves thought but which I’m skipping for now). Performance poetry in particular highly values this sense of the authentic: as Maria Damon has written, “the criterion for slam success seems to be some kind of “realness”—authenticity at the physical/sonic and meta-physical/ emotional-intellectual-spiritual levels” (329). As earlier noted, the practice of the poetry reading has evolved from one in which an actor performs the work to one in which we highly associate the performer of the piece with the writing of the piece (see Wheeler, Hoffman for comprehensive histories of poetry performance). Perhaps due to the confessional movement, we have also come to associate seemingly autobiographical content within the poem with the actual life experiences of the poet/performer. Basically, it seems that we assume that the experiences shared in a performed poem actually happened to the body onstage sharing that poem. The questions raised by McMillan and the others on the ‘Body of Poetry’ panel about permission and consent take on new meaning when the poetry being performed is about bodies and when the audience assumes it’s about the body of the performing poet. Do we as audience members automatically have the poet’s consent to assume that these experiences happened to that body? When the poems concern normally unseen and unspoken physical acts and spaces, are we invited through the act of the poet’s public performance to let go of normal social barriers and think about them: to envision the poet in those situations? By placing photos of her naked chest in her books and by honestly discussing her mastectomy through her poetry onstage, is Best inviting us to consider the reality of her performing body, to mentally undress her? These can be intensely uncomfortable questions, and their answers will vary poet to poet: there are no universal answers, and it’s vital to respect the poet’s privacy, regardless of any perceived sense of invitation. Last year I wrote about an experience in which my performance was perceived to have invited audience access into my personal life which I actually found invasive (“Do Confessional Poets Forfeit our Right to Privacy?”). I’m just beginning to consider the implications of these questions in the field of contemporary performance poetry; I’ll be posting more here as I develop this thinking more. 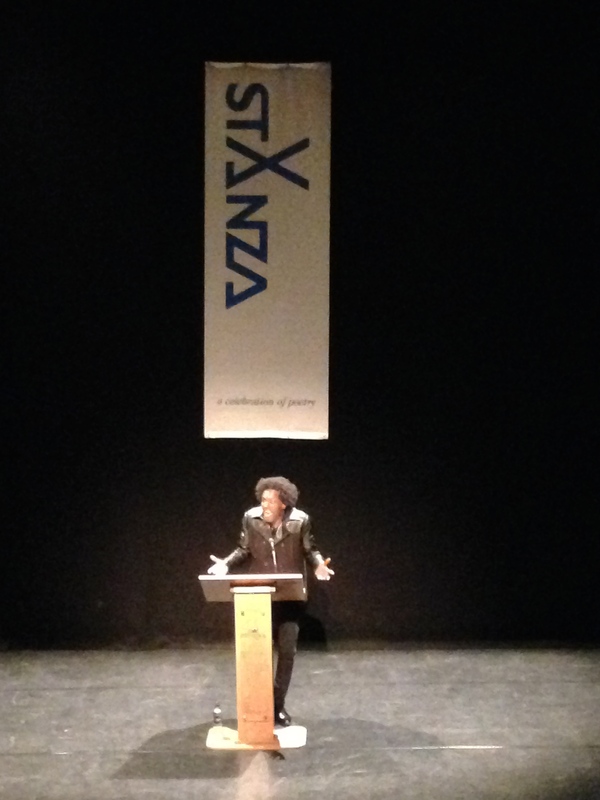 Suffice to say for now that StAnza’s focus on the body in poetry was an excellent and important forum for considering the ways in which poetry can engage with physicality and the complex politics of invitation and engagement with that intimate subject. I’m realising these reflections are growing rather lengthy, so I’ll just share some final thoughts on the other two themes of the festival this year. The theme of ‘City Lines’ running through its program invited us to consider the ways in which poets have engaged with their physical environments, again both in the content of the poetry and in its distribution. The Friday morning breakfast panel on ‘City Lines’ sparked lively discussion over the value of the city in poetry: Darran Anderson noted that traditionally in poetry the city has been a behemoth to escape from, while Kevin Mclean pointed out that high-population urban environments are vital for healthy spoken word scenes to flourish, since that style of poetry requires a regular, diverse, and engaged audience. The City Lines breakfast panel on Friday morning, with (L-R) Harry Man, Darran Anderson, Jim Carruth (chair), Kevin Mclean, and Matthew Griffiths. The spotlighted language this year at StAnza was German, and the festival featured not only a wealth of German-language poets and projects, but also a focus on translation. During her reading, Meg Bateman paraphrased Christopher Whyte’s idea that ‘translation is always transformation,’ which seemed to encapsulate much of the conversation around translation at the festival. The StreetLyrics project featured on a Thursday Meet the Artist event involved German, English, and Gaelic poets collaborating on a book featuring poetic responses to photographs of manhole covers in Scotland and Germany. While I walked in somewhat skeptical—why manhole covers?—the project quickly grabbed my attention for how it considered a normally ignored object as symbolically rich metaphor for pathways and concealed layers. The way in which the English-language poet translated her version of the poem from German, by painstakingly looking up each word in the dictionary since she didn’t know any German at the start of the project, illustrated the vast variety of ways in which poets can transform work from language to language. I unfortunately missed the Sunday morning breakfast panel on translation (darn Sunday bus schedules! ), but others said it was a rich discussion of how work shifts in that transition. Photos of Kevin Mclean and myself taken by Dave Vallis during our Poetry Cafe on Thursday, March 3. Before I conclude . . . One of the aspects of StAnza I’ve appreciated the most is their dedication not only to showcasing the very best of contemporary poetry, bringing in the big names from the U.K. and internationally, but also to nurturing new writers. For me and Kevin as relative newcomers to the scene to be booked for such a massive festival was a huge honour, and speaks volumes about StAnza’s commitment to supporting new voices. Throughout the festival I was massively fangirling over the seasoned writers whose work I admire (sorry for being awkward, Jo Bell! You’re awesome! ), and to share the bill with them was tremendously exciting. StAnza is so important not only as a platform for poetry performance but also as a social hub where poets and poetry publishers, promoters, and appreciators can get together to share ideas, plan collaborations, and of course drink a little (lot of) wine. Kevin and myself with the wonderful Annie Rutherford on opening night of the festival. It’s also a festival which encourages collaboration and showcases the positive effects of partnerships (read more about this in one of Carly’s blog posts). StAnza is very much enabled by teamwork: it’s helmed by the wonderful, tireless Eleanor Livingstone and Annie Rutherford and made possible through the work of many staffers and volunteers. A huge thank you to them for working around the clock this weekend to pull off another tremendous festival: I hope you get plenty of sleep this week! 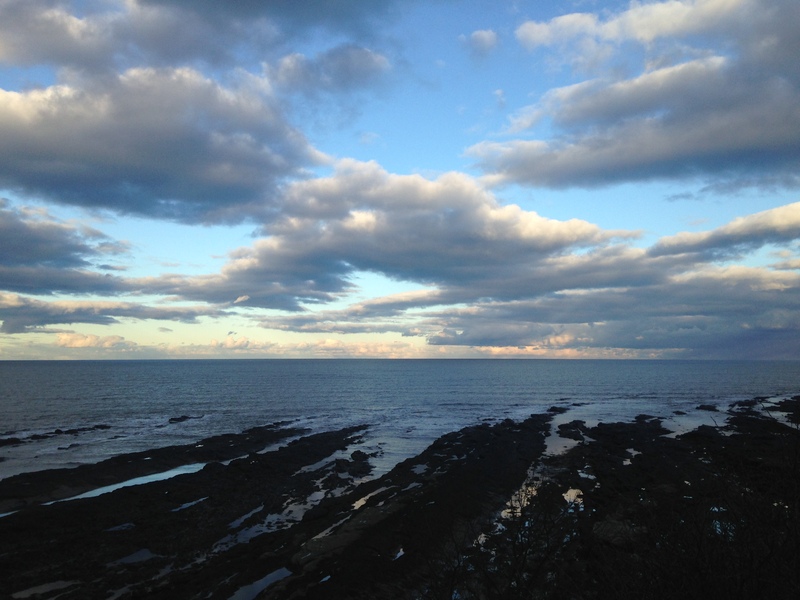 A good-bye to the sea at the conclusion of the festival – back to Glasgow for now! Damon, Maria. “Was That ‘Different,’ ‘Dissident’ or ‘Dissonant’? Poetry (n) the Public Spear: Slams, Open Readings, and Dissident Traditions.” Close Listening: Poetry and the Performed Word. Ed. Charles Bernstein. N.p., 1998. Web. Hoffman, Tyler. American Poetry in Performance: From Walt Whitman to Hip Hop. Ann Arbor: University of Michigan Press, 2013. Print. Wheeler, Lesley. Voicing American Poetry: Sound and Performance from the 1920s to the Present. Ithaca, NY: Cornell University Press, 2008. Print.